When you first move into your home, you probably got your living room decorated and arranged just the way you wanted it. But, as the years passed, your space likely became cluttered, and now you’re stuck with a living room that isn’t stylish or comfortable. If you have come to the realization that you need to free up space in your living room, but you have no idea where to start, these five ideas are a great place to begin. It’s true that large, puffy, overstuffed couches and chairs with reclining footstools are comfortable, but they sure do take up a lot of space. At least they look like they take up a lot of space! Many traditional couches, and even some chairs, are enclosed on the bottom, giving the piece of furniture a large appearance. If your furniture seems to be overwhelming your space, consider couches and chairs with legs. Couches and chairs with exposed legs give the appearance of taking up less space than other furniture styles, even if they’re the same size. You can even get a chaise sofa that enables you to lay back and relax without having to rely on a bulky recliner! There are a lot of furniture pieces that are nice to have. End tables can really come in handy for snacks and drinks when you’re sitting down to watch a movie, while a buffet table can be extremely useful when you have guests over for a dinner party. The trouble is, they can take up a lot of space when they aren’t in use. Instead, consider decorating with foldaway furniture. Some end tables can be folded flat against the couch when not in use, while folding buffet tables can be stored in the garage. You can find desks that fold away into hanging portraits, and of course folding chairs can be stored in a closet. It is a lot easier to put your TV on a TV stand and call it a day. It’s also a great way to provide your space with extra storage. Many TV stands accommodate movies, CDs, and other items. Unfortunately, TV stands also take up a lot of room. If you want to free up space, you should definitely look into mounting your flat screen TV to the wall. Just make sure you look up how to do it properly. You don’t want your television crashing to the floor in the middle of the night! Don’t feel comfortable hanging your TV on the wall? Consider replacing your bulky TV stand with something much smaller. A stand with a glass top is also a great way to make your space feel bigger. Baskets are an amazing way to organize a space. When used for storage, they can free up space in your home and make your space feel larger. Wicker baskets, and baskets that are made out of natural materials, are popular, but they aren’t your only choice. Wire baskets are great in modern and industrial spaces. Plus, they can make your space look larger when they are empty! 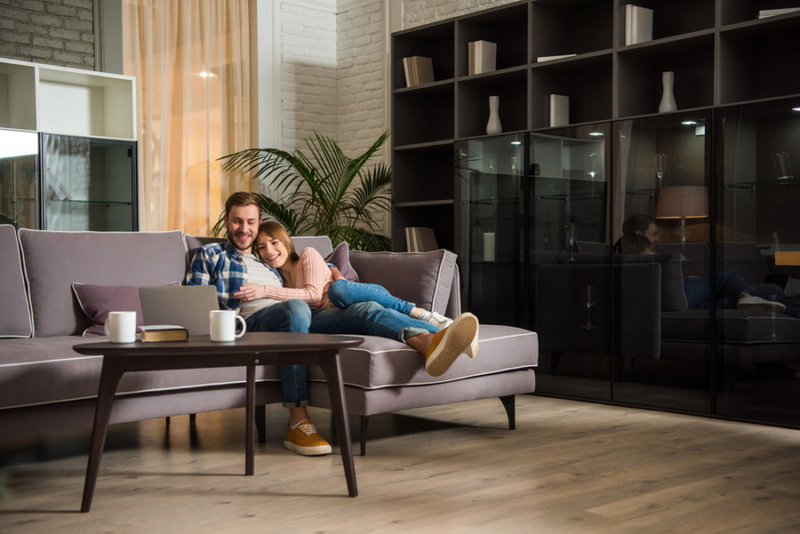 There are a few things you should do every single day inside your home to keep it clean, like wipe the kitchen countertops and put dirty dishes in the dishwasher, but you should also add picking up the living room to your list of daily chores. If you spend just a few minutes every day putting books, stray pieces of paper, and other items where they belong, your living room won’t have a chance to get cluttered in the first place. It also saves you from spending a Saturday afternoon tidying up when you’d rather be doing something else! You shouldn’t throw your hands up in the air in frustration if your living room is feeling a little cramped. There are plenty of things you can do to take back your space. Whether you want to update your furniture or you’re looking for storage solutions, there’s something on this list for everyone!